If you wear multiple-wear contact lenses (be they soft contact lenses with a monthly or 2 week disposal, hybrid lenses, or even RGPs), you have probably experienced the significant decrease in lens comfort common as a contact lens reaches the end of its life span. The lens may feel grimy, filmy, and deposited. It may feel dry and brittle along the edges. It may move around more on your eyes, or stick more to your eyes at the end of the day. Luckily, there is still hope for monthly, 2 week, and extended wear contact lenses to have better comfort -- you just need to look at your solution! Cleaning your contact lenses is a lot more than just dropping them into a container with solution. Over the course of your day, your contact lenses are exposed to airborne debris in your environment, lotions and makeup products like mascara that you use around the eye, eye drops that you are using for redness, dryness, or itching, and your own tear film. That is a lot of exposure for a thin little piece of polymer draped over your eye every day. To achieve maximum comfort and performance, you need to be able to remove all of this debris at the end of the day from your lenses and start fresh the next morning. If you use a multi-purpose solution like Opti-Free or Renu, that is why rubbing your lenses is such an essential step. But if you really want your lenses to feel brand new (or as close as possible without changing to daily disposable lenses), you need something even stronger in your solution regimen. Neutralization time is only 4 hours whereas Clear Care has a 6 hour time window. For most patients this shorter time may not be a huge advantage because their lenses are being cleaned overnight, but if you have a job where your schedule shifts from day shift to night shift, or an irregular sleeping schedule, a 4 hour process could have a major advantage. Bausch and Lomb included an extra wetting agent in their solution (Polymer 181) that binds moisture to the lens at a higher rate than older generation hydrogen peroxide solutions. Bausch and Lomb's own market study reports that their product strongly out performs Clear Care on the amount of surfactant (moisturizer) found on the lens surface at the end of the day, leading to better all-day lens comfort. I love Clear Care, but long ago I found myself baffled by their right and left lens basket design. Why make it so hard to see? The little L in the corner that is beige on beige plastic? That is a recipe for disaster in people that just took their contact lenses out! A genius at Bausch and Lomb decided this was a problem that could be fixed, so they made the right side white so it is really easy to keep your lenses properly separated. Especially in presbyopes or high hyperopes, this design can mean a lot. Have you tried PeroxiClear yet? Please leave me your thoughts and comments because I would love to hear if you find this product better than other hydrogen peroxide systems on the market! Agreed about the color helping to distinguish sides. But why did B & L make the basket left side colored and right side white? It's opposite with their contact lens holders, a design which has been around a lot longer and therefore would set the precedence. For consistency, I go by the color only - colored for right lens, white for left, ignoring the "R" and "L" imprinted on the basket. In terms of comparison, I haven't sufficient experience to notice a difference. But can safely say that at minimum, this new B & L product performs (cleaning and comfort) equally to CC. New basket and solution of PeroxiClear on left. Old basket and new solution of ClearCare in middle. New basket and solution of ClearCare on right. 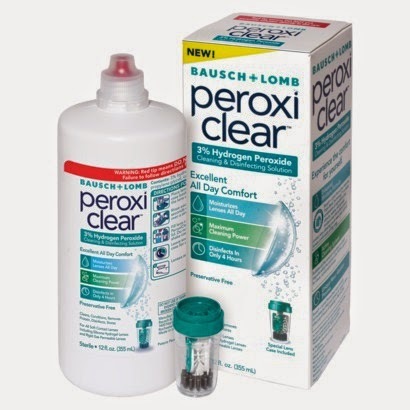 New PeroxiClear is very bubbly as is new ClearCare in different ways. Former is continuously vs the latter "pulses" for lack of better term, where bubbles cling to catalyst, build up, then released in waves. Not sure which is better, if any significant difference. Not shown here but bubbling characteristic seems to be dependent on the solution and not the basket, ie. 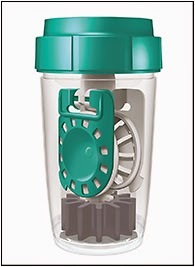 in a different test, PeroxiClear solution in ClearCase basket produces same type of bubbling as in its native basket and vice versa. With the old ClearCase basket with same fresh, new solution, bubbling is not as vigorous and presumed to be not as effective at cleaning. Not sure what happens in an old PeroxiClear basket (this is the first and so far only one used) but presume reduced bubbling action. Bubbles act as gentle abrasion to remove debris. Dr. L: Feel free to copy that video. I'm not sure how long I'll keep it online. Thanks so much for sharing this! And I agree; I thought that the color scheme was backwards as well but I'm not sure if they had some ulterior reason or if it was just an oversight. Can u leave your contacts in peroxiclear overnight ? I was devastated when I found out that I can no longer obtain peroxiclear. I had been using it since it came out on the market, I had finally gotten rid of the chronic eye irritation that I have been having for years. I had had a 3 month supply and had not been aware that there had been a recall. Is there anyway I can obtain the product from the manufacturer without going through retail? Within a week of going back to my previous disinfectant solution the red blurry itchy eyes have returned with the strong stinging sensation when first putting in my contacts. Also the word ability of my contacts is much less as I often work 12-hour shifts and I'm practically unable to focus by the time I get off. Please help me find some peroxiclear. Luckily Peroxiclear has only been temporarily recalled so it will be available again soon. In the meantime ClearCare is the best replacement (also a hydrogen peroxide solution).